﻿Do I Need A Chimney Sweep to Know that my chimney is safe? safety of your chimney: 1. Dirty Flues and 2. Cracks or Holes in the Flue and/or chamber. The chimney sweep knows that dirty chimney flues can cause chimney fires that can spread to the rest of the house. Chimney fires burn at over 2,000 degrees. They can warp, bend and break your flue that allows the heat and flame to escape into the walls. Once the fire is in the walls it spreads very quickly to the rest of the house. A good chimney sweep will keep the soot from building up so that a chimney fire never starts. The second main safety issue a chimney sweep checks for is cracks and holes in the flue and chamber that can allow heat and flame into the house causing a house fire. The chimney sweep knows that anywhere heat and flame can escape the chimney and get into your walls is a fire hazard and make the chimney unsafe to use. Sometimes people think that just because they have had a fire without incident that they are safe. We like to use the example of parking under a rotting tree branch, even though it didn't fall on your car yesterday it may fall today. The best thing to do is remove the branch, or in this case repair the chimney. The chimney sweep also know that holes and cracks in the flue and chamber can also allow smoke to seep into your walls allowing poisonous gases like carbon monoxide to collect. Carbon monoxide poisoning can be fatal. Our chimney sweeps recommend that everyone get a smoke detectod with a carbon monoxide alarm. As a home owner you can look in your flue to see if it is dirty and needs a chimney sweep. The chimney sweep standard for a prefab chimney is 1/8 inch of soot or more needs a chimney sweep, and for a masonry chimney is 1/4 inch of soot or more needs a chimney sweep. The best way for a home owner to know for sure that you don't have either of these unsafe conditions is to have your chimney cleaned and inspected every year by a professional chimney sweep, like Ash Away Chimney Sweeps. During the chimney sweep's inspection he will also check for other conditions besides these safety issues. The chimney sweep will be looking for rust and places where water can leak into your home causing drywall and plaster damage, mold and wood rot. A professional chimney sweep will explain to you the condition of your chimney and will let you know if there are repairs needed on your chimney which issues are safety issues and what the priority is in your repairs. 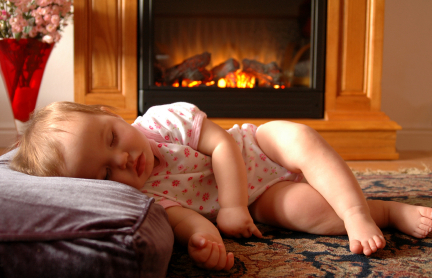 An inspection by Ash Away Chimney Sweeps in Jacksonville, FL, NE Florida and SE Jacksonville can give you the peace of mind that burning in your fireplace will not put your family at risk.